Picky Vicki BBQ sauces are steeped in Midwestern BBQ tradition. Each sauce is a play on the standard Kansas City recipe. These thick, tomato sauces run the gamut from sweet and mild to bold and spicy. 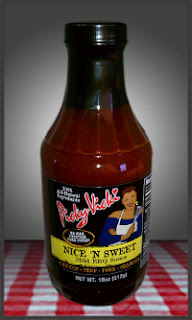 I previously reviewed Picky Vicki's Brazenly Bold sauce and recently got the chance to enjoy their Nice 'N Sweet recipe. Like their other sauces, Nice 'N Sweet is sold in 18 oz. glass bottles with Vicki's signature black labels. The sauce is a rich mahogany color in the bottle. Nice 'N Sweet is ultra thick with a slightly coarse texture. The sauce starts with a tomato base and adds vinegar, natural sweeteners and a blend of savory spices. Nice 'N Sweet has a sweet, familiar initial flavor. Like most Kansas City style sauces, Nice 'N Sweet also features a smokey element and just a little bit of spice. Where the sauce breaks slightly from tradition is with its vinegar content. Nearly all BBQ sauces contain some degree of vinegar, but Picky Vicki's sauces finish with a very strong tang. I used Picky Vicki's Nice 'N Sweet on smoked chicken. The thick sauce clung to the meat well. The sweet and tangy flavors complimented the mildly smoked poultry very well. The vinegar tang was subdued after the sauce was cooked leaving a sweet, mild finish. The one (minor) criticism that I have is the sauce's appearance after being brushed on the chicken. Rather than the smooth, glossy shine that I look for in a glaze, Picky Vicki's texture is slightly gritty. It doesn't affect the flavor, but if presentation is important, then it's something to consider. Picky Vicki's sauces are also great for cooking. I've used the sauce in jambalaya, sloppy joes and tacos. The thick sauce mixes well into a lot of dishes. The flavors blend well in casseroles and can be used with a variety of meats. To learn more about Picky Vicki's entire product line, check out their website. 0 Response to "Picky Vicki Nice 'N Sweet"